Stop me if you’ve heard this pitch before – someone, at some point, is traveling the globe. Somehow, in the marketing pitch, that gets folded up and you’re led to the creation of a watch company. Well, we do have a similar sort of a story going on with today’s watch, the Watches for the World Equinox. Fortunately, it’s not just another “me too” minimalist clone that is all-too-overdone these days. You’re probably asking, why is this even a watch that I’d be looking at? Sure, the Watches for the World Equinox looks different than what’s out there now, but it’s really got a heavy chronograph look to it (more on that in a bit). The story on how this review came to be is actually a bit of a disclosure – this is a watch created by one of my co-workers at my day job. To be sure, we’re in separate offices and divisions, but I want to be clear that there was a relationship outside of this watch review. Ok, disclaimer out of the way, let’s get back to the review. So, one of the first things that set the Watches for the World Equinox apart for me is the fact that they’re tying their sales to helping out a non-profit. Currently, it’s set to help out the EESI, but there are some plans to open up some options for customers to have more choice. Regardless, you’re picking up a watch and helping out an organization, not a bad one-two combo. Second, let’s talk about the design of the Watches for the World Equinox. As I’ve mentioned, this is not just another “me too” two- or three-hander. Sure, it’s obviously built from catalog components, but it looks different enough from what I’m used to seeing that I want to reward that. At first, I was convinced that the watch was a chronograph, from the photos. Once I got the watch in, I realized that was not the case – it was something much more to my liking. You see, the Watches for the World Equinox can track a second time zone. The upper register on the dial, that’s a 24-hour indicator that’s tied to the main time display. The lower one, that’s another 24-hour indicator, but you can control what the offset is (I, of course, went for 6 hours). How do you do that? With the pushers flanking the crown, of course. One to advance, the other to retreat. Once set, well, you can ignore the pushers. It’s an interesting twist (good or bad, your call) to give what is, ostensibly, a world time watch the chronograph look, but it’s certainly unique. 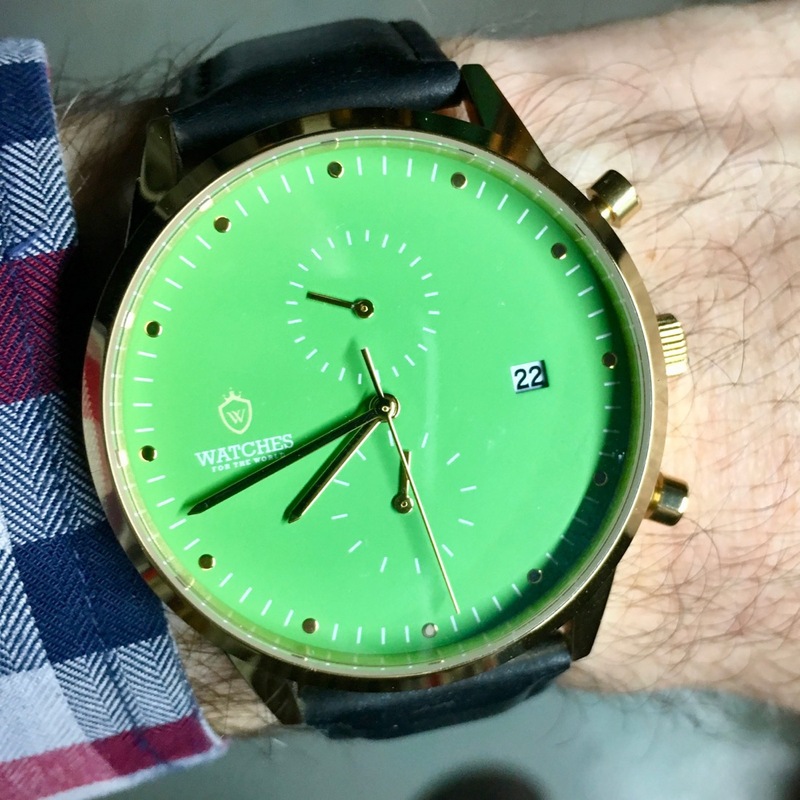 Also unique is that bright, almost neon, green dial on the Watches for the World Equinox. This certainly makes the watch stand out, and fits the theme of supporting the EESI as well (green, dontchano). Here, with the gold-tone case, it’s a tight combination. Of course, you could opt for the black or silver tone case as well. Either way you go, you’ve got a 64g watch on your wrist (with the included strap) that gets the job done, telling you the time (and even another time) and the date. As long-time readers will know, the style and gold tone aren’t really my style, but even so, I found the Watches for the World Equinox to be an able daily companion. The high polish on the case gives it a flexible utility, and the polished hands were easy to pick out against the flat dial. If I were going to give design notes, I’d say the case needs to shrink. It feels thicker than it needs to be (since it’s not a chronograph), and could have the diameter shrunk a bit as well (as evidenced how in-board the date display is). For what it is, though – a first outing for a brand with a parts-catalog watch, it’s a solid freshman effort. The best thing about it: No denying how eye-catching that dial color is!